ParaPicker® PP02 are super-dynamic, dual-axis, parallel kinematic Pick&Place systems with linear drives. 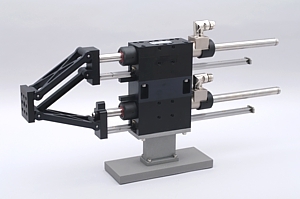 In 2005 we developed a dual-axis, parallel kinematics robot, which used linear direct drives as actuators. Back then, our parallel-kinematic CF rod design already showed the industrial standards of today. ParaPicker® PP02 Pick&Place are the development to the industrial product and are based on our established HighDynamic® linear motor modules. 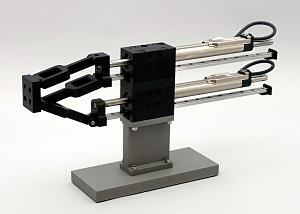 In 2013 PP02 was first introduced at the MOTEK fair in Stuttgart. For our Parapicker® Pick&Place systems, we preferably use controllers out of the LinMot® range.